Co-authors Peter Singer and Emerson Brooking talk about their book LikeWar, with PDC President Adam Powell moderating. If you participate in social media, you are being spun. And that’s a problem for government communicators, especially in public diplomacy. 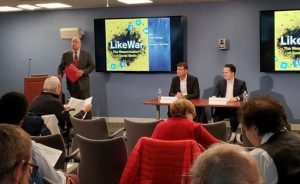 LikeWar: The Weaponization of Social Media, published just two months ago, has been termed by Amazon Press as “the best book of 2018”. The book’s co-authors, noted scholars of 21st century new media Peter W. Singer and Emerson T. Brooking, talked recently with First Monday Forum guests about their work to demystify digital propaganda. As Singer put it: “We are all hard-wired for online stories.” That central idea is a serving an array of causes both good and evil on every continent. They asserted that governments are ill-equipped to cope with exploitation of digital media, citing specifically the State Department’s Global Engagement Center. Ironically, the basic techniques of influence — amplifying a message, hiding its true identity, and targeting audiences — remain the same. They have simply been adapted to the information age. That’s where U.S. Government-sponsored media come in. A telling example occurred in the waning days of 2017 and well into January a year ago. That was a record outburst of anti-government demonstrations in Iran against the regime in dozens of protests in scores of towns and cities. It was covered extensively by U.S. taxpayer-funded media, notably the Persian language services of the Voice of America and Radio Free Europe/Radio Liberty, and Radio Free Asia to China and other totalitarian Asian countries. But a distinguishing feature of this outbreak was the voluntary participation of Internet-connected Iranian citizens throughout Iran. Farda and VOA received more than 150 separate voluntary on line videos of the unrest from citizen observers throughout Iran. Those that passed the test of careful verification were shared on the U.S. networks and in Persian and greatly enriched the information available to all Iranians, at home or abroad. 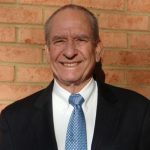 Such cross-pollination of content, a newly-energized U.S. international broadcasting staff and improved management of the five U.S. networks yielded an all-time record worldwide audience surge last year for VOA, RFE/RL, Radio Free Asia, the Middle East Broadcasting Network and Radio-TV Marti in 2018. All five networks reached 345,000,000 TV, on line and radio users in 2018, up from 278,000,000 the previous year. VOA’s total: 276,200,000, just shy of the total for all five networks a year earlier. Globally, not including the United States, VOA, according to Director Amanda Bennett, reaches four times more people each week than CNN, Fox News, and NSNBC’s combined domestic U.S. audience. That’s based on research in more than a hundred countries worldwide, with more than three billion people. But international media watchers are quick to ask for examples of actual impact in these numbers. Are these U.S.-funded broadcasters making a difference? Apparently authorities in the Peoples Republic of China think so. August 1 last year, a Chinese dissident scholar, 84-year-old Sun Wenguang, was doing a live phone interview with VOA’s Mandarin Service in Washington at his Shandong Province residence when PRC police burst into his apartment, terminated the discussion, and hauled Professor Sun off to a detention center. He was allowed to return home about a week and a half later under strict surveillance. On August 13, two VOA journalists, correspondent Yibing Feng and his assistant Allen Ai, went to Professor Sun’s apartment and managed to interview him through a locked front door. He told about his detention in a PRC military hotel and four other locations. He was hauled away again for interrogations, before being allowed to return home with four Chinese government guards sleeping in his and his wife’s residence. This follow up conversation also ceased abruptly, when two PRC police arrested the VOA journalists at the door of the apartment and hauled them off for questioning at a nearby detention center. “It is outrageous,” VOA Director Bennett said, “that two journalists have been detained for doing their jobs.” She appealed for their release, and a few hours later Feng and Ai were indeed freed. A compelling vignette, in 2018, ranked by Reporters Without Borders as the sixth consecutive year of decline in press freedom globally. After two decades, the five networks known as the Broadcasting Board of Governors (BBG) were re-christened collectively last August as the U.S. Agency for Global Media (USAGM). They have continued to build credibility, fully aware of the complex challenges cited in the Peter Singer and Emerson Brooking 400-page book, LikeWar. As CEO John Lansing of the five networks and VOA Director Amanda Bennett have often said, the unfailing commitment of more than 3,700 USAGM employees across the five networks to truthful news and information has inspired both growing audiences in every region and increased sharing of content among the networks. Even with the U.S. government shutdown, those essential to getting the programs on the air and on the web have soldiered on. The new around-the-clock joint multimedia Russian language program Current Time led by RFE/RL in Prague, the Czech Republic, and jointly produced with VOA in 2018 registered more than 1.3 million multimedia weekly followers in its first full year of formal operations. Ms. Bennett announced late last year that VOA 365, a similar joint Persian language venture of VOA and RFE/RL produced in Washington at Voice headquarters, was scheduled for launching early this year. Recently, VOA and RFA have amassed a joint multimedia audience in Chinese of more than 70 million listeners a week.